call on this number – 00923017103383, named Suresh Pandey. Its early morning, 28th May 2014, Just 7 AM got a call from +923087587989. I received then it replied that I am calling from Apple company and in a lottery you have won 20 lakhs and to avail and get the winning amount just call on the Number : “00923017103383″ and talk to suresh pandey. I was surprised the way he was responding to my answers, but when i made the screw tight then i felt the sweat from his mind and cut the phone line. so, the message to all you guys is to have proper investigation of the person, who claim just type of incident. Fake callers, emails, message are every where, don’t get trapped other wise it will make you weep and nothing else. No company, make a winning amount until or unless you make a ticket of it, or you have proof of participation in the lottery programme or any other winning amount. so, If you have got just type of call, just lodge an FIR , we will take action on your part and make you aware of the real fact. ha pensato che potresti essere interessato a 1 x Knick’n’clean – Protezione dai batteri e dai germi nel frigo di Biosa Italy. 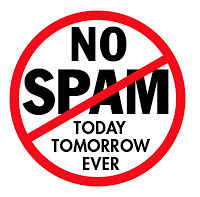 This messenge is from Naukri.com to al Employers registered with naukri.com.We are currently undergoing maintenance exercise to improve our quality service and reduce the rate of spam in our job portal. You are a potential finalist with a chance to win Rs. 17,00,000.00 cash in the third and last stage of Rupees One Crore Sweepstakes 2014. An Official Invitation has been issued in your name. It confirms that you are amongst those selected from the whole of India, who may activate an exclusive Sweepstakes entry opportunity. If you are drawn winner of our Grand Prize, you’d have sole claim to a cash amount worth Rs. 17,00,000.00. You may be surprised to know that in all of India, less than 1% of the households have been selected to receive a fabulousoffer from Reader’s Digest. While many of your neighbours will never be selected, you have already been fortunate enough to clear two of the three stages there are to becoming a winner in our Rupees One Crore Sweepstakes 2014! Now it’s all up to you to make the most of your opportunity. Simply click here to access the private web site to activate your Sweepstakes entry opportunity. P.S. When people receive a Sweepstakes invitation — like the one you now have — they often decide to discard it, thinking, no one ever really wins. And it is a fact that if you choose to ignore the chance to enter the Rupees One Crore Sweepstakes 2014, you will never win anything in the Draw. Don’t let this guaranteed opportunity slip away, just clickhere to access the site and you could win Rs. 17,00,000.00. Act quickly! * Reader’s Digest will send you emails from time to time, to inform you about our latest activities and promotions, because we value you as our customers. However, you may discontinue this at any time – just send an email to [email protected]with the subject header <Unsubscribe> and we will remove you from our emailing list promptly. Hi – Do You Have Money Problem? Please Check this ! Do you have Money, Job or Love Problem? Try this once. The end of worries and true happiness, because YOU deserve it so much ! subject: Hi – Do You Have Money Problem? Please Check this !. We are recruiting on behalf of infosys and we have some urgent requirements for which your profile is suitable. You must submit your resume through our recruitment portal. We do not accept CV through Email. Once we receive your resume, you will hear from us soon. Click here to Apply for Infosys. our 2014 email philanthropically winning promotion. We are pleased to inform you that your email address has been awarded the sum of One Hundred Thousand Dollars which is equivalent to (Rs 6,034,500.00) Sixty Lakhs Thirty Four Thousand Five Hundred Indian Rupees by Pepsi IPL Award Lottery United Kingdom. We have randomly selected 5 email addresses through a computer ballot system to receive an award of One Hundred Thousand Dollars (100,000.00 US Dollars) each as a part of our 2014 email philanthropically winning promotion. The 2014 Online Award was conducted from an exclusive list of over 105,000,000 e-mail addresses of individuals and cooperate bodies picked by an advanced automated random computer search machine. After the automated computer ballot system, your e-mail address emerged as one of the five lucky winners in the category ‘A’ with the following: Batch Number: Ccuk004412012 and Winning Number: Ccuk04567 which we would want you to re-confirm below as you reverse this email with the below claims information. Above all, we urge you to send all the necessary details via: [email protected] to enable us expedites action towards the delivery/transfer of your entitled fund.